Most modern electronics, from flat-screen TVs and smartphones to wearable technologies and computer monitors, use tiny light-emitting diodes, or LEDs. These LEDs are based off of semiconductors that emit light with the movement of electrons. As devices get smaller and faster, there is more demand for such semiconductors that are tinier, stronger and more energy efficient. 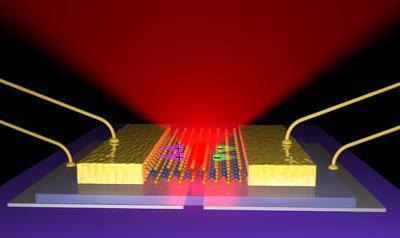 University of Washington scientists have built the thinnest-known LED that can be used as a source of light energy in electronics. The LED is based off of two-dimensional, flexible semiconductors, making it possible to stack or use in much smaller and more diverse applications than current technology allows. 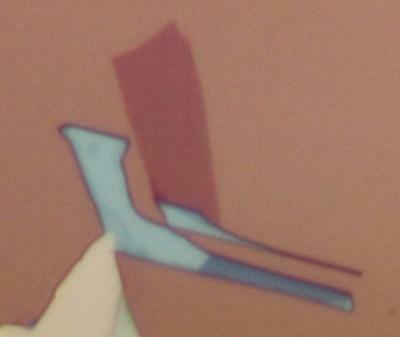 "We are able to make the thinnest-possible LEDs, only three atoms thick yet mechanically strong. Such thin and foldable LEDs are critical for future portable and integrated electronic devices," said Xiaodong Xu, a UW assistant professor in materials science and engineering and in physics. "These are 10,000 times smaller than the thickness of a human hair, yet the light they emit can be seen by standard measurement equipment," Ross said. "This is a huge leap of miniaturization of technology, and because it's a semiconductor, you can do almost everything with it that is possible with existing, three-dimensional silicon technologies," Ross said. "A promising solution is to replace the electrical interconnect with optical ones, which will maintain the high bandwidth but consume less energy," Xu said. "Our work makes it possible to make highly integrated and energy-efficient devices in areas such as lighting, optical communication and nano lasers." The research is funded by the U.S. Department of Energy, Office of Science, the Research Grant Council of Hong Kong, the University Grant Committee of Hong Kong and the Croucher Foundation. Ross is supported by a National Science Foundation graduate fellowship.